“My dear Watson, you as a medical man are continually gaining light as to the tendencies of a child by the study of the parents. Don’t you see that the converse is equally valid. I have frequently gained my first real insight into the character of parents by studying their children.” (Sir Arthur Conan Doyle, The Adventure of the Copper Beeches). While Sherlock Holmes was referring to humans, this statement above can be equally true when applied to a word and its relatives. Holmes, the embodiment of intelligent deduction based on evidence, suggests that insight into parental character is gained from an examination of the offspring. So too can this method be applied to word study and lead to insight into the ‘character’ of a word. Our inquiry began with the five words I hope students will understand well in regard to the Middle Ages, our current unit of study: power, obligation, dissent and punishment. Look at the words below. Are you, dear reader, able to identify the families? Each of the words above belongs to a family with four members. As a family, they share the same root. In the room, there are five families- each with four words. Your task is to find the family. Note- some families have 3 different base elements, some two different bases. Look closely at the morphemes and the graphemes forming the base. In order to reunite with your family, you must mentally remove affixes and search for another word that has the same base element or a base element that could potentially belong to the same family! Do this in silence!! Once you have gathered into potential families, ask each member to divide the word into morphemes (a word sum). Be prepared to justify your analysis. You’ll note the insistence on silence which heightened the focus on the words (mostly!) and individual consideration of potential morphemes. We then reconvened as a whole group. I placed five roots on the board and inviting one member of each group to take the root from which their words had derived. They were asked to justify their selection. In cases where the root was Latin, I gave the infinitive and the supine forms. Close observation of these etymons allowed students to confirm the related base elements as being etymologically connected. In justifying the selection of the root, students referred to graphemes that could be seen in the base. This process helped students to understand that one root could lead to several related base elements. After justifying a claim to a particular root, students were asked ”Based on the members of the family, what do you predict the root means? What language do you predict the root is- why?” This helped students to consider the common meaning at the heart of each word and led to thoughtful discussion and questions about each word in their ‘family’. At this stage of the inquiry, students were asked to divide the word into morphemes and to consider whether they should develop another hypothesis. Students are becoming adept in recognizing the Latin suffixes <-ere>, <-ire>, <-are> that mark the infinitive form. Asking students to find the meaning link between words helps generate deeper thinking about a word and forces students to use their own resources, ask questions, formulate hypothesises rather than rushing off to a resource to regurgitate what they consider to be ‘the answer’. Slowing this initial process down, talking through hypothesises and asking questions of each group has helped students interrogate the resources with a little more care. You will have noticed in the videos there are places where students should have reinserted the final non-syllabic <e> at the end of the base element: <punish> and <potent> being two such examples: <pote+ent> and <pune+ish>. I am waiting to see if the students come to this realization in their further research. If not, we will again discuss what we understand about the function of the <e> when final and non syllabic. Stay tuned for the next breathtaking episode of Finding Family where the challenge lies in representing the family in webs and matrices! In considering a visual representation of family, I immediately leapt to The Cholmondeley Ladies. 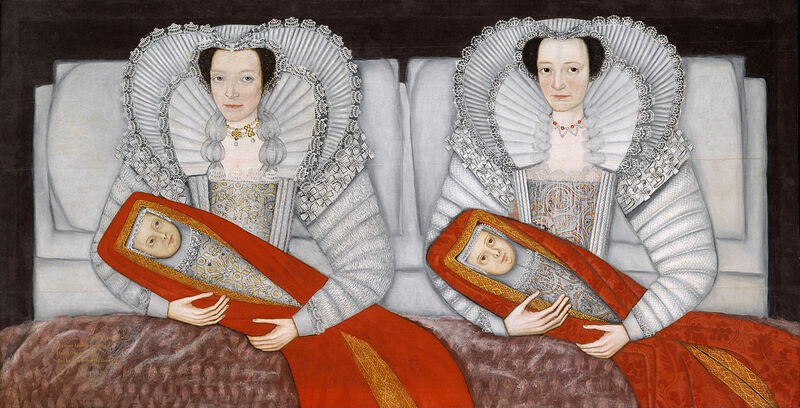 This double portrait of the imperturbable baby presenting, bed-sitting sisters has remained vivid after seeing this at the Tate Gallery many years ago. Likewise for other viewers. Go here to read an eloquent description of Michael Bird’s first encounter and interpretation of this Jacobean portrait embedded in his essay The Perception of Symmetry for the Tate Gallery magazine. This is worth the read not only for thoughtful insights into the painting above and symmetry in art but also for Bird’s application of the etymological understanding of symmetry, mirror and individuality.